a tribute to the Dreaming. When purchasing "Wings for the Heart" you do not need an account in PayPal. 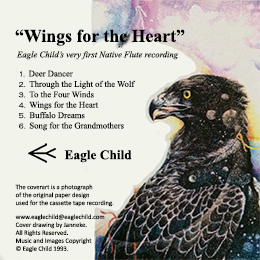 IN CANADA ONLY: "download my songs" from EagleChild's shop. 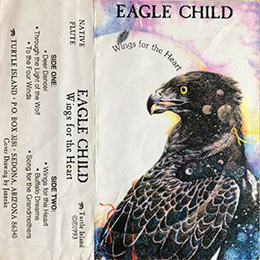 To order wholesale direct, please contact EagleChild Music for further information. and their Native customs and traditions. in your audio-visual projects. This license is not transferable to another individual, group, or organization. All projects involving television, radio, and broadcasting will require guidelines and a license. and the role the Native flute music has in your project to obtain the required permission. Unauthorized reproduction, distribution and rental is prohibited.